Formula E presented motorsports governing body FIA with a preliminary list of eight cities that have been picked to host races next year. Cities included in the preliminary calendar are: London, Rome, L.A., Miami, Beijing, Putrajaya (Malaysia), Buenos Aires and Rio de Janeiro. 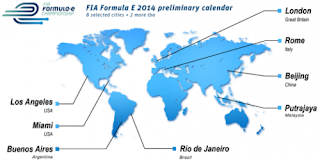 Since its launch in August, Formula E has received formal demonstrations of interest to host a race from 23 cities across five continents. London Mayor Boris Johnson said: "Zero emission world class motor racing is a scintillating concept, and I am hugely keen that London be involved in the birth of Formula E. It has the potential to highlight the impressive strides being made in the manufacture of electric vehicles and hosting a street race could also be of considerable economic benefit to our city." Formula E intends to organize up to 10 races in '14. The final calendar will be presented to FIA for its approval at the World Motor Sport Council in September. Formula E CEO Alejandro Agag said: "We are thankful to all the cities that have expressed their willingness to host our races. At the moment we are working with the eight selected cities on the feasibility and design of the street circuits. They will all be in city centers, easily accessible by public transport, and will feature some of the most beautiful and well-known landmarks as a spectacular backdrop for the races." The racing series has two confirmed teams for '14. In a recent interview with SBD Global, Agag said: "This is not a Championship focused only on the average motorsport fan. [It] is targeting a different and younger kind of public, that is not at the moment into motorsport, but is keen on issues like environment, social media, free streaming, and video games. We think there is a niche for this in the global motorsport scene."